Data recorded by the Tinytags will help assess the impact of water temperature on the development rate and survival of catshark embryos. ELMO is a citizen science project which aims to provide long-term data on Southern African shark, skate and ray (Elasmobranchii) populations, and encourage open data sharing and communication between organisations with similar interests. The database will help scientists, politicians and stakeholders to make informed decisions about the protection of the Elasmobranch populations. Data is collected locally by snorkelers, divers, swimmers, sailors, anglers and beach walkers, noting Elasmobranch sightings, as well as their egg cases, along the coastline. Three submersible Tinytag Aquatic 2 data loggers are used in a project to provide information about South African catshark reproduction. Lab experiments indicate that embryos develop significantly more slowly in colder water (e.g. in Cape Town) than in warmer water (e.g. Port Elizabeth). Therefore shark pups in Cape Town would be exposed to predators and biofouling for much longer and probably have a smaller chance to survive than those in Port Elizabeth. SCUBA divers across South Africa have been recruited to monitor their local reefs for sharks and their eggs. Additionally, a dedicated group of divers will monitor the development of individual shark embryos in their eggs over a whole year in three specific locations. They will re-visit the same eggs every two weeks and determine the development stage of the shark embryo. 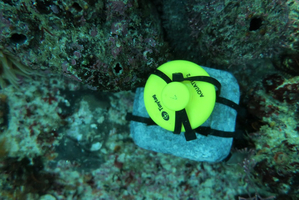 Lisa Schroeter, Project Manager for ELMO, comments "The Tinytags are an ideal solution for recording temperature on the reefs that are being regularly monitored for the 12 month period. The information they provide will offer a first insight on the impact of water temperature on the development rate and survival of catshark embryos." One Aquatic 2 data logger is located in the Cape Town dive site, carefully placed amongst the kelp. The second logger was deployed on a dive site named Longbeach, also in Cape Town, while the third will be deployed in Port Elizabeth. Results are expected to show a slower development rate in the colder Cape Town waters than in the slightly warmer Port Elizabeth waters. This would mean that shark embryos in Port Elizabeth are exposed to threats for a shorter period and may have better survival chances than embryos of the same species in Cape Town. "Aquatic 2 data loggers have been widely used for environmental research," comments Cathy Clark of Gemini Data Loggers. "Their ability to be left underwater in cold, harsh conditions for long periods makes them an ideal solution, and of course their bright yellow cases make them easy to spot for retrieval when the time comes!"